You can edit, delete, or rename the title or slug of your saved layout templates. You can organize the display of your saved templates into categories in Beaver Builder, as shown in the following screenshot. You can export custom templates to use on other sites, or you can import templates from your own sites or other sources. 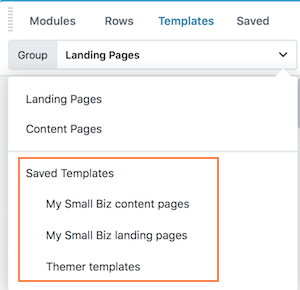 If you have the Agency version, you can replace the set of built-in templates with your own set, making it easier to provide your clients with a custom solution. Your templates are displayed in a grid style the same way that the built-in layout templates are normally displayed. 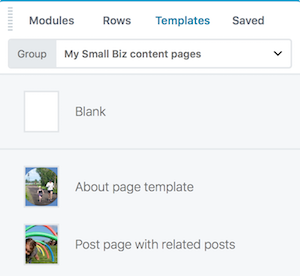 See the article on replacing the built-in layout templates with your own. See the Related Articles below to find out more about how to accomplish these tasks.